After nearly two decades of legal challenges against racial segregation in public schools and higher education, on May 17, 1954, the United States Supreme Court ruled in court case Brown v. Board of Education of Topeka that school segregation was unconstitutional. Their decision paved the way for desegregation of educational institutions. Before Brown v. Board of Education, legal segregation had existed under the "separate but equal" doctrine, but for the most part, the separate educational facilities and opportunities the Southern states offered to African Americans were inferior, not equal, to those for white Americans. In 1956, Virginia's General Assembly adopted a policy of "Massive Resistance," using the law and courts to obstruct desegregation. In 1958, the governor closed schools in Warren County, Norfolk, and Charlottesville rather than allow them to desegregate under court order. The following year, state and federal courts invalidated Virginia's "Massive Resistance" statutes, but public schools in Prince Edward County, where the Virginia case against segregated school had originally been filed, remained closed for five years as some white Virginians fought desegregation of schools. From the 1930s throughout the 1970s, lawyers for the National Association for the Advancement of Colored People (NAACP) fought in the courts to achieve equal pay for African American teachers and equal facilities and curriculum for African American students. Lawyers such as Spottswood Robinson, Oliver Hill, and Thurgood Marshall, argued that black students' rights had been violated under the Equal Protection Clause of the Fourteenth Amendment. Virginian's reactions to Brown v. Board of Education were varied -- while some approved the decision enthusiastically, there were also those who bitterly opposed it. 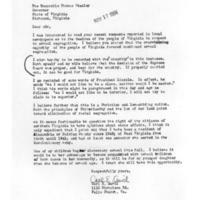 This document, a letter from Carl E. Auvil, resident of Falls Church, Virginia, was written to Governor Thomas B. Stanley in November 1954 to express his views on the matter. 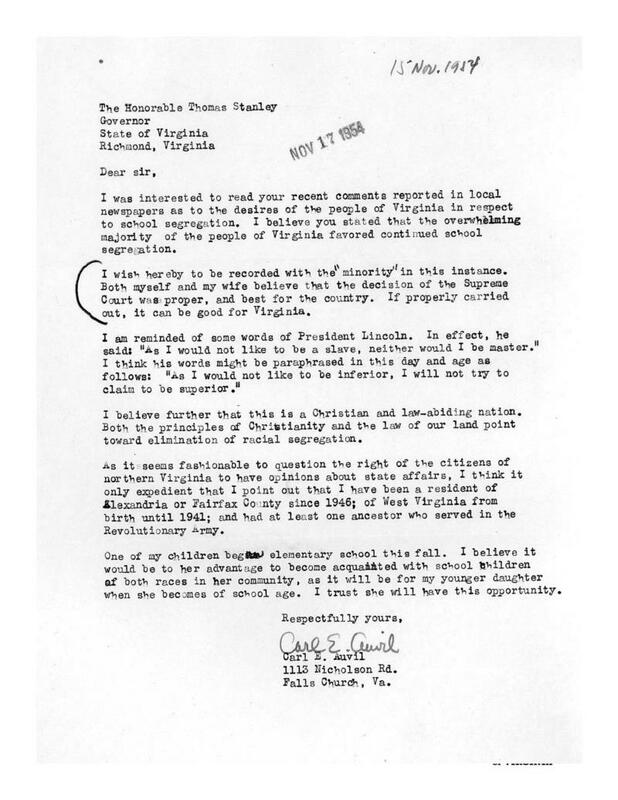 Citation: Letter from Carl E. Auvil, Falls Church, to Governor Thomas B. Stanley, Richmond, November 15, 1954, Office of the Governor, Thomas B. Stanley Papers, Library of Virginia, Richmond, Virginia. Analyze: Where does Carl Auvil stand on the Brown v. Board of Education decision? Analyze: Why do you think Carl wrote that he was in the "minority"? Do you think he was? Why or why not? Analyze: Why would Virginians want to keep schools segregated? In Their Shoes: Imagine you were a student in Prince Edward County when the schools were closed. Would you have been able to receive an education? If so, how? 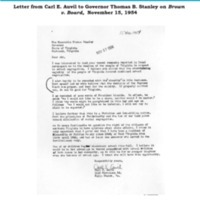 “Letter from Carl E. Auvil to Governor Thomas B. Stanley on Brown v. Board, November 15, 1954,” Document Bank of Virginia, accessed April 21, 2019, http://edu.lva.virginia.gov/dbva/items/show/196.